When it comes to promoting interest in Minneapolis-Moline tractors and machinery, you won’t find a more versatile group of MM enthusiasts than those who make up the MM Collectors. 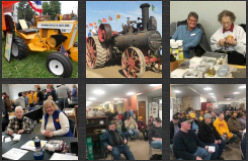 The club was organized by MM fans to share knowledge, memorabilia, stories, parts and anything else about Minneapolis-Moline and all of its predecessor companies. In 1997, to be sure the MM legacy reaches younger generations, the Collectors established an annual scholarship, which is now worth $750. The Minneapolis-Moline Collectors are unique in making a scholarship available each year to anyone who is a current MMCI member, member’s child or grandchild. The applicant must attend a vocational school, two year, or four year college or university. If you or a family member is interested in applying for the scholarship, go to the application resources below. The scholarship winner is announced at the MMCI Summer Show. Applications are due May 1 of each year.